MARY SIMON @ Gear Music: Canada's Best Online Music Store! 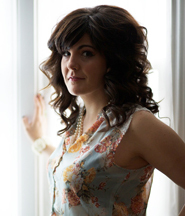 Mary Simon is both vocal coach and piano teacher working at Gear Music since June of 2009. Her love of music and her desire to share her passion has encouraged many students as well as motivating them to develop their own talents. Mary is paying it forward as a result of her own experience when a high school teacher guided her voice from a simple choir girl into a sought after soloist. As a piano teacher she is a firm believer that ear training is as important as being able to read music and strives to help her students connect the technical with the creative. Focusing on contemporary music she encourages her students to choose their own pieces so they will be inspired to practice. Mary is also known to be an accomplished singer-songwriter, recording five CD’s of original music and composing music for the past 16 years. She has also toured across Canada and throughout the United States several times. Mary has written songs which she has licensed to ABC and the Lifetime Network. Still writing, recording and gigging you can listen to her voice and music at www.marysimon.com.